On Tuesday September 17th 2013, the Mayor and City Council of Coos Bay, Oregon unanimously voted down a resolution not only condemning, but clarifying the duty of city officials to interpose against, the possibility of indefinite military detention without trial (on mere suspicion of terrorist affiliations) opened up for Coos Bay residents by the federal government’s passage of the 2012 National Defense Authorization Act. At Tuesday’s meeting, Tom McKirgan (S.W. Oregon Coordinator of Oath Keepers) and Rob Taylor (of the activist group Coos County Watchdog) were only allowed a total of three minutes each in which to present their “Restoring Constitutional Governance Resolution,” with Mayor Crystal Shoji aggressively chastising them, saying they had already expressed their views at a September 12th work session – one which neither she nor two thirds of the councilors voting had chosen to attend. Councilor Mark Daily, who had arranged, yet neglected to attend the work session, made the initial motion to vote against the resolution. At one point Police Chief Gary McCullough accompanied by a sergeant maneuvered behind Mr. Taylor to deter him from delivering further testimony. 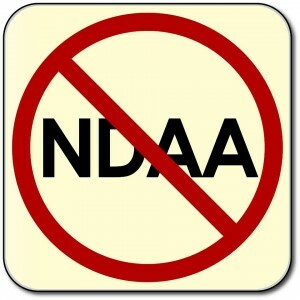 Section 1021 of the NDAA expands Congress’ post-9/11 authorization for war with Afghanistan to permit detention, without trial and lasting “until the end” of U.S. hostilities to combat terrorism, of anyone accused of “substantial support” of forces “associated” with 9/11-affiliated groups or alleged to have supported “hostilities” in aid of “enemy forces” or in this context to have “committed a belligerent act.” A U.S. district court has already declared the expansive terms of this section unconstitutional, although its decision is being fought through higher courts. The resolution voted down by the Coos Bay City Council had been drafted in a collaboration between Oath Keepers (a network of past/current law enforcement and military personnel, firefighters and first responders pledged to disobey unconstitutional orders), Patriot Coalition General Counsel Richard D Fry, and People Against the NDAA (PANDA) a national grassroots organization lobbying state and local governments for non-enforcement of the NDAA. At the September 12th work session, attended by councilors Melton and Groth, the city attorney had urged that the city should fear repercussions from the federal government if it produced a yes vote on the resolution. McKirgan, Taylor, and State PANDA Director Shane Ozbun had stressed the need for council members to keep their oaths of office made to uphold both the U.S. and Oregon Constitutions. At the final meeting, several city councilors expressed concerns that interpretations of how the U.S. Constitution might be applied were best left to the federal government. Concerned citizens are urged to respond to the World Newspaper editorial at bit.ly/1bhUq4C in its comments section and also at bit.ly/17a1wDU, and also to phone/email the Mayor and City Council using numbers and email addresses at http://coosbay.org/government#mayor-and-city-council (although Dr. Muenchrath should not be phoned at the medical clinic number listed for him). City Manager Rodger Craddock and Police Chief Gary McCullough can also be emailed at mrcraddock@coosbay.org and mgmccullough@police.coosbay.org.